With all the buzz around the newly launched Impossible Foods and Beyond Meat, it looks The Economist was right - 2019 is really kicking off to look like "the year of the vegan". As we get increasingly conscious of our deteriorating environment, veganism and plant-based meat substitutes have emerged as the latest trend in the food industry. And these culinary innovations aren't only targeted at the vegetarians - they also hope to help provide meat-eaters a way to cut down on consumption without (too much) compromise on tastiness. Sure, a humane meat alternative sounds great, but is saving the world a luxury reserved for the rich? VEGAN BURGERS IN SINGAPORE - HOW MUCH DO THEY COST? 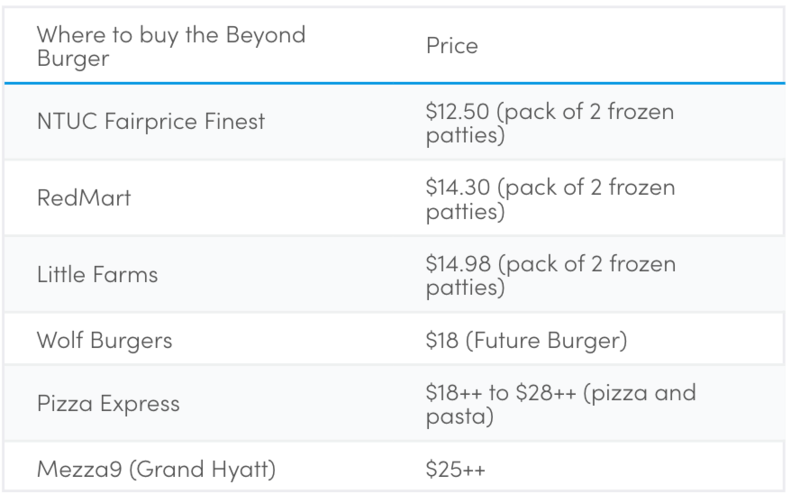 Let's take a look at the prices of the 2 hippest non-meat burgers in town, the Impossible Burger and the Beyond Burger. Beyond Meat launched in Singapore late last year, hitting both restaurants and supermarkets with the Beyond Burger patty. The Beyond Burger "meat" apparently "looks, cooks and satisfies like beef", and the main source of protein comes from peas. It also contains beet, so the patties actually "bleed" when you cook them - just like the real deal. 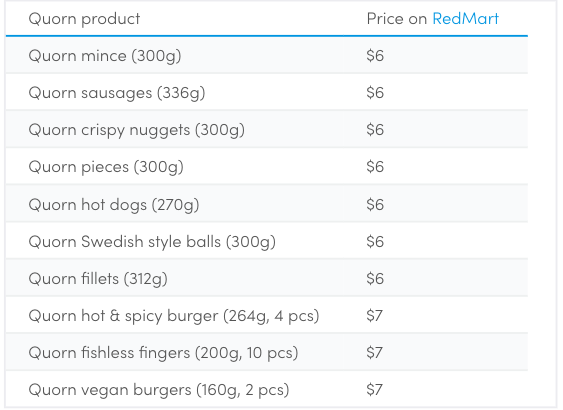 Beyond Meat is slightly cheaper than the Impossible Foods equivalent (as you will see below). However, unlike the Impossible Burger, the Beyond Burger patties are available at several supermarkets as a frozen pack of 2. Prices range from $12.50 to almost $15, which comes up to $6 to $7+ per patty. That's quite expensive for a home-cooked meal. If you prefer to eat out, there are several restaurants you can order Beyond Meat. At the fancy Mezza9 at Grand Hyatt, a burger will cost you $25++, but at Wolf Burgers it's only $18 (Future Burger). Pizza Express also recently launched a vegan-friendly menu, featuring curried Beyond Meat (the mince, not patty) on either a pizza or with pasta ($18++ to $28++). They also have a few dishes featuring a pseudo-pork "meat" called Omnipork ($23++ to $26++). Omnipork is blend of plant-based protein from peas, non-GMO soy, shiitake mushroom and rice. The Impossible Burger launched earlier this month (Mar 2019), partnering 8 restaurants including the Michelin-starred Cantonese restaurant, Empress. The Impossible Burger by Impossible Foods is similar to Beyond Meat - except it's made with soy and potato protein, sunflower and coconut oil, and heme, which is the molecule that gives meat its distinctive taste and "bloodiness". The Impossible Burger seems more expensive, but that could be because it's only carried by fancy restaurants. The cheapest burger is at Park Bench Deli where it's $22++ for an Impossible Patty Melt. If you don't mind mini ones, Cut by Wolfgang Puck serves sliders for $18++. Decked out in delicious onion marmalade, XO mayo, cheese, heritage tomato and ketchup, the new Impossible Dream makes the burger dream very, very possible. I tried the Impossible Dream ($27++) at Three Buns Quayside (they also have it at Potato Head Keong Saik), and was super impressed with the non-meat. It tastes just like beef, with a delightful char on the edges and a creamy "medium rare" centre. If you want something slightly cheaper, consider the Impossible Chedda ($23++). At Bread Street Kitchen by Gordon Ramsay, the Impossible burger is $25++. If you just want a taste of the plant-based meat, you don't necessarily have to get a burger patty. Some restaurants serve it in side dishes too, which is more affordable. 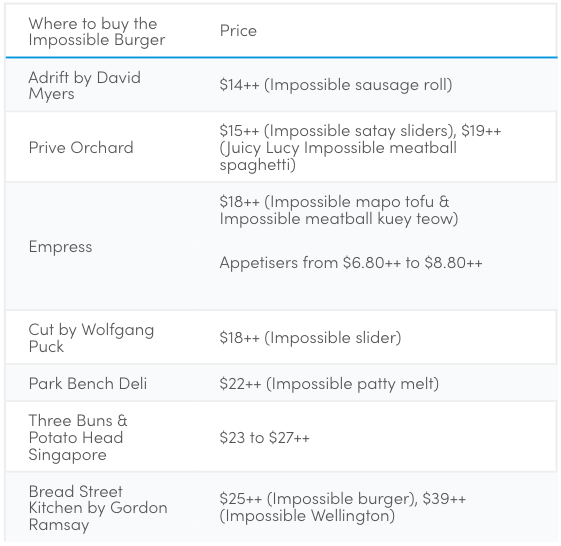 At Adrift by David Myers, the Impossible sausage roll is $14++, and at Prive Orchard, there are Impossible satay sliders ($15++) and Impossible meatball spaghetti ($19++). You can even have the Impossible meat in Cantonese cuisine: Empress has Impossible mapo tofu ($18++) and Impossible meatball kuey teow ($18++) dishes. They also have appetisers from $6.80++ to $8.80++. So yes, if you want to indulge in plant-based meat meals, you'll can expect to spend $35 to $40 per meal. For most plebs like us, that's too expensive. Thankfully, there's a more affordable alternative - Quorn, which is available at most supermarkets. The mock meat gets its protein from a fungus - fusarium venenatum - which is fermented to make mycoprotein. It supposedly tastes more like chicken nuggets than beef, but at this price, it's worth experimenting with recipes. Quorn also has frozen meals like pies ($5.90 to $6.90).